Gangster Squad had potential. Not the blow-you-out-of-your-seats potential, and certainly not summer-blockbuster potential, but maybe future-cult-favorite potential. That potential was as unrealized as an unlit match. Looks pretty, but does not get the job done. The cast was so promising with Emma Stone, Ryan Gosling, Josh Brolin, Sean Penn, Giovanni Ribisi, and Nick Nolte. All have some history of acting. Yet somehow each only appears to try. And by try I mean not really try at all. Case in point: Ryan Gosling and Emma Stone have fantastic chemistry with each other in Crazy Stupid Love. The pair reunited is why I wanted to see Gangster Squad. They are both still ridiculously attractive; however, neither can muster anything more than puppy-dog eyes as emotion in this movie. Pretty did not get the job done. Josh Brolin stars as the Sgt. John O’Mara, a determined veteran willing to fight the L.A. Chief of Police’s war against the local mafia. 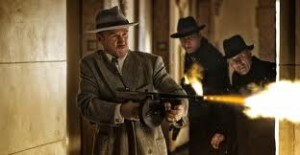 The main boss running the city’s underground rackets is Mickey Cohen, played by an overly made-up Sean Penn. To his credit, Penn does animate mobster Mickey Cohen with vigor. He’s brutal, ruthlessly ambitious, and angry; anger being only emotion he can show through the twenty-two pounds of makeup he wears. Penn winds up looking like a comic book villain with a case of megalomania. On the other hand, Josh Brolin looks perpetually constipated, and he can’t blame the makeup. I don’t know which is worse. Ugly doesn’t get the job done either. Gosling plays one of Brolin’s “gangster squad”, the rebels of the police force who forgo their badges while knocking off Cohen’s joints. He’s just not convincing as a vigilante, possibly due to his effervescent youth, maybe because he’s not trying. Like I mentioned before, he can’t even get visibly excited about Emma Stone, who plays Cohen’s main girl Grace Faraday. I poked around a little and discovered that director Rueben Fleischer has directed one other feature film, Zombieland. That’s a comedy about zombies. This is a period piece from 1949. I think Fleischer may have been out of his comfort zone. The two similarities of his films are the red-headed Stone and graphic gun violence. Also, the plot could have come from a shelf of mob movies and wannabe film noirs. It’s as original as white bread. There is a slip of a subtext about coming home from war and being uncomfortable in the normalcy of 1949. I suspect the director meant to go somewhere meaningful, but got lost somewhere in Hollywood land along the way. To be fair, Gangster Squad was not terrible to watch—there’s a handful of funny moments, and some stylistic choices that were sound, like color saturation and set design. So it’s a great Netflix choice when you’ve gotten done with all of this year’s Oscar nominated films. And maybe some of the upcoming summer releases, too. ….. and this is teaching our kids what? Gun violence is OK, as long is it is only in the movies…. Really! BTW… once all assault rifles are banned, where is Hollywood going to get the weapons? I hear the outcry from Hollywood about gun violence yet they produce the stuff and think it has no effect on society, yet Washington is interested in curbing it in video games. I don’t get it.. The difference is that Hollywood is a big source of political donations whereas video game characters are not.